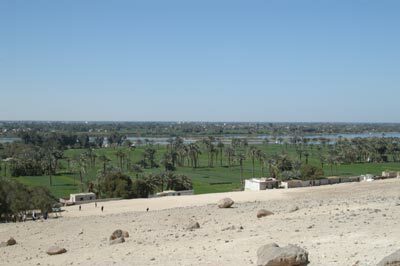 Most tombs in Egypt are on the west bank of the Nile. The east bank, the rising of the sun, signify life. The west bank is for death and funerary monuments. But, here between MInya and Mallawi, is a range of tombs on the eastern bank. There aren't any suitable cliffs on the other side, so the tomb builders had to make do. THe tombs here are colorful and are a good representation of the Middle Kingdom style of art. It also represents a move away from burials in Saqqara, and that the local officials were more independent. THere are 39 tombs here, althougyh most of them are unfinished. 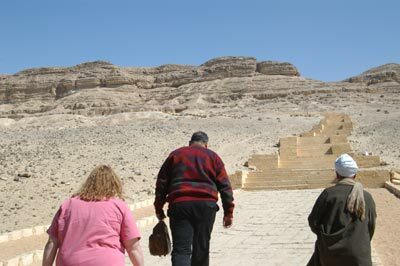 There are only four open to tourists - Baqet III, Amenemhet, Khnumhotep, and Kheti. The four show the change in style of tombs between the 11th and 12th Dynasties., from the mastaba tombs of the Old Kingdom to the new shaft tombs that the New Kingdom brings in Luxor. 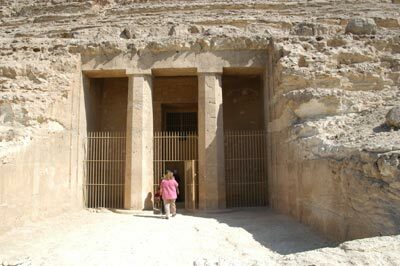 The tombs here have large porches and vestibules, and the mummy of the occupant is sunk deep in a burial shaft within the tomb. THe decorations are also a mix between the two styles -- standard images are mixed with images of wresting and war, a precurser to the decorations of the New Kingdom tombs. They are the firs tto show scenes of sports and games, as well as daily life. Dancing, music, and entertainment suddenly show up as important images. It's a heck of a climb to the tombs, and it can be very hot. Make sure to bring water.